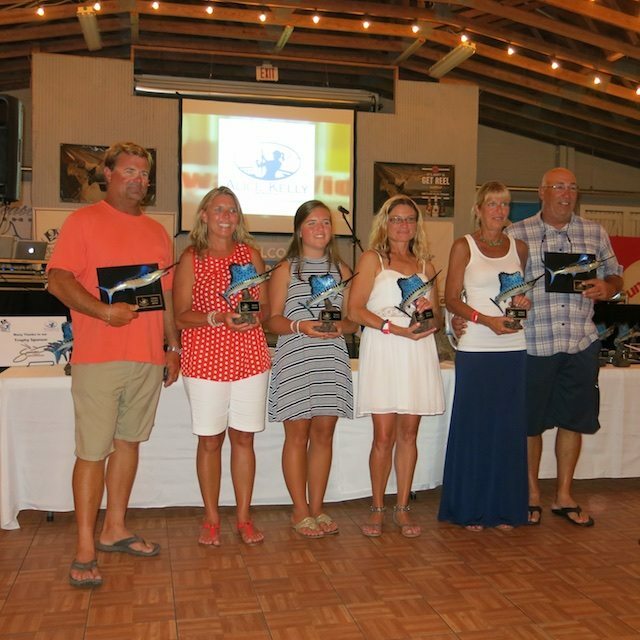 Paul Mann Boats Dominate 27th Annual Alice Kelly Ladies Only Billfish Tournament August 14th 2016! LO QUO SEA takes first place! The 56’ Paul Mann LO QUO SEA held the first place positon after a full day of action and tough competition from all 92 boats entered in the 27th Alice Kelly Ladies Only Tournament! LO QUO SEA, captained by Kevin Paul, racked up five sailfish releases, good for 500 points to win. Lora Whitehurst and Karen Kremser scored two sails apiece, while Amy McGurk added another. Andrew Brady and Lenny Schelin are LO QUO SEA’s excellent mates. But that wasn’t all! Capt. Dennis Endee and boat owner Cheryl Russell and her family team aboard the 56’ Paul Mann A-SALT WEAPON captured a third-place finish with four sails and a nice dolphin. Cheryl brought two sails to the boat, while her 14-year-old daughter Allyson got two more. Lori Landstrom also boated a dolphin aboard A-SALT WEAPON. “We started off to the East/Northeast and worked our way back into the shallows,” Russell said, “The action started about noon and we had all our bites within an hour on circle-hooked ballyhoo. My daughter Allyson loves to fish, so this was partly a family outing and partly to support a worthwhile charity. 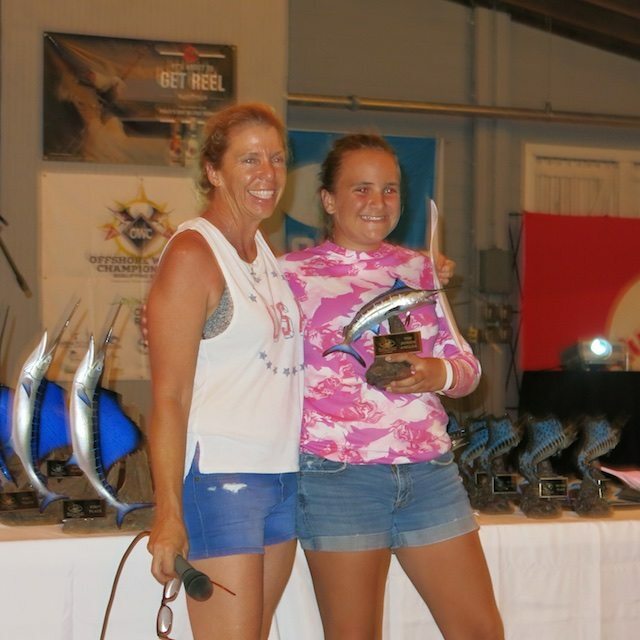 It was very exciting to be competing against this many teams.” 500 lady anglers competed in the Alice Kelly Memorial Ladies Only Billfish Tournament this year. By “lines out,” at 3:00 P.M. Sunday, a total of 61sailfish, nine white marlin and seven blue marlin had been brought to the boats and released. Perhaps most importantly, more than $30,000 was raised for the Outer Banks Cancer Support Group. Twelve-year-old Emily Bracher, competing aboard PELICAN, another well-known 56’ Paul Mann with her Uncle Capt. Arch Bracher, earned the Top Junior Angler after releasing a blue and white marlin. The Alice Kelly optional jackpot money is a take-all contest for the boat landing the largest dolphin. This year’s winner of $14,875 was SNIPER, a 58-foot Paul Mann with Owner/Capt. Jimmy Bayne. 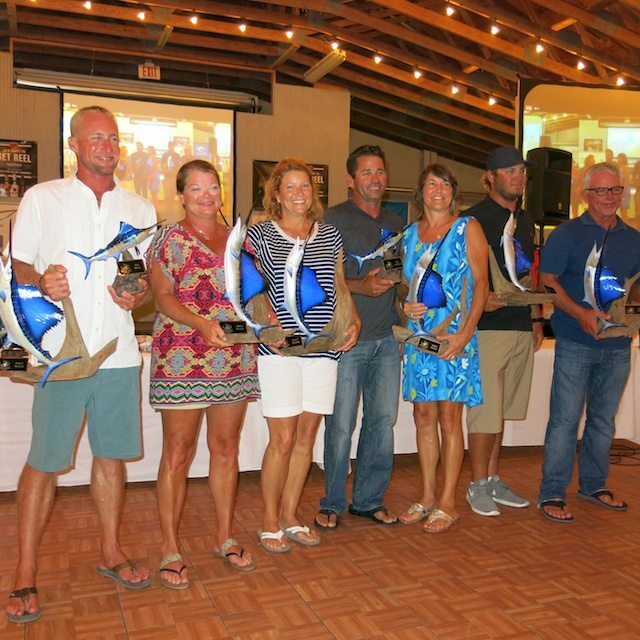 Diane “Super D” Steyn captured that 17.7-pound winning fish and she also earned the Paula Stanski Award for Angling Excellence as the top angler for two sailfish releases, plus the dolphin. All participants earned a huge shout out and congratulations for their releases, but especially the Paul Mann fleet!